Date: Nov 13 2018, 6:30 p.m.
Family & MWR invites you out each Tuesday to challenge your knowledge of pop culture, sports, military history and more during Trivia Night. 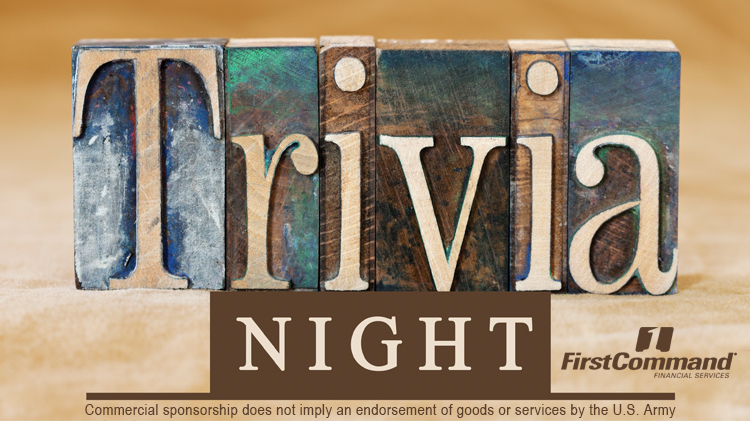 Trivia starts at 6:30 pm and will consist of three rounds of five questions each. The top finishing team will claim awesome door prizes. *Commercial Sponsorship does not imply endorsement from the Department of Defense, U.S. Army or Fort Lee. No cover charge and free appetizers! Sign up to get Family and MWR Events, News & Updates delivered to your inbox!